Sen. Tammy Baldwin, D-Wis., speaks during a news conference in the Capitol on Democratic on gun control measures, June 16, 2016. Baldwin co-authored a letter on Monday urging the FDA to reconsider a policy restricting gay men from donating blood.Tom Williams / CQ-Roll Call,Inc. Priorities USA and House Majority PAC are planning a $10 million digital ad campaign in 40 House districts. State races for attorney general are seeing a boost for Democrats amid the ongoing ACA lawsuit. 2020: Jeff Merkley is staffing up in Iowa and New Hampshire, notes Alex Seitz-Wald. CT-GOV: Things are getting personal in the Connecticut governors’ race. FL-GOV: Ron DeSantis gingerly broke with Trump over his Hurricane Maria claims. Now, POLITICO reports, Trump isn’t happy. FL-27: Democrats are worried that Donna Shalala isn’t doing what she needs to do to lock down her race, POLITICO writes. IN-SEN: The AP writes that Republicans are fretting about Mike Braun’s chances in what had looked like a great pickup opportunity. MD-GOV: Larry Hogan is up big over Ben Jealous, another new poll finds. MT-SEN: Jon Tester talks about hunting a lot, but he hasn’t had a license for six years. TX-SEN: A new poll shows Cruz up over O’Rourke by nine points with likely voters. Don’t forget — there’s a libertarian on the ballot in the Senate race in Texas, too. TX: Republicans scored an upset in a Senate special election runoff in the state. WI-1: It’s a family affair in the Bryan Steil v. Randy Bryce ad war, writes NBC’s Ben Kamisar. 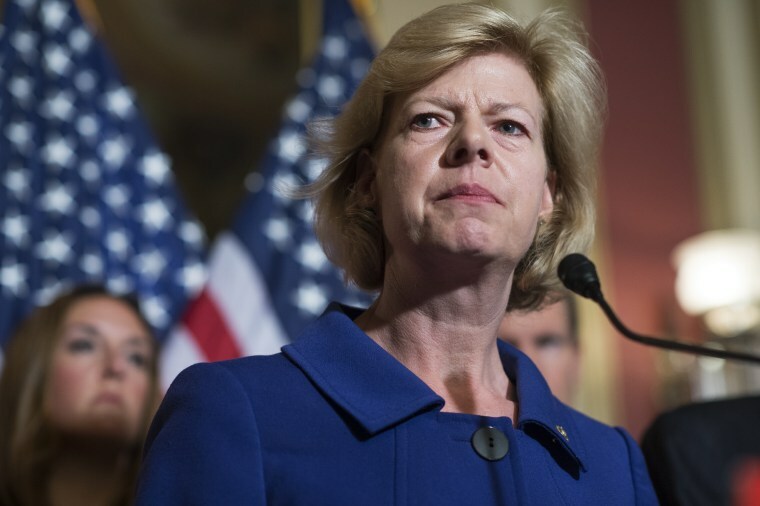 WI-SEN: Tammy Baldwin has a wide lead over Leah Vukmir in the latest Marquette poll. WI-GOV: And Scott Walker is trailing Tony Evers. TRUMP AGENDA: Is the GOP creating another Anita Hill moment? Democrats are warning that Republicans are creating another Anita Hill moment, writes our own Leigh Ann Caldwell. And Mike Memoli notes that Joe Biden has lots of thoughts on how this moment is like Hill’s. George W. Bush is sticking with Brett Kavanaugh. The Washington Post writes on how Christine Blasey Ford’s life has been upended by going public with her allegations. Kavanaugh’s previous quips about excessive drinking are drawing new attention. Intel officials may be trying to slow Trump’s ordered release of classified documents. Congressional leaders are not happy about how Trump bypassed them in calling for the document release. Mike Pompeo is raising eyebrows for his planned appearance at the Values Voter Summit, a gathering of socially conservative activists.